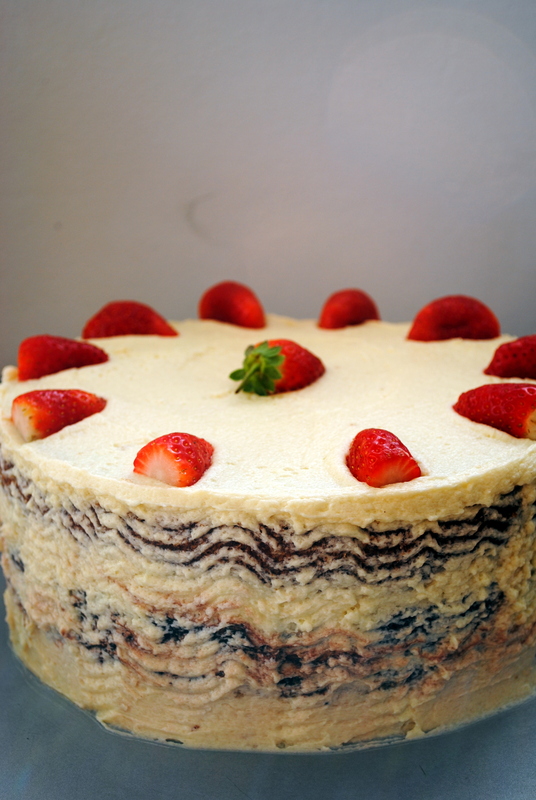 Before attempting to make it, I didn’t realize that shadow layer cake is a regional specialty of New York and Long Island kosher bakeries. It’s Evan’s favorite cake, a special treat that arrives from uptown, or Best Ever bakery in Massapequa Park. Aptly named for it’s layers of white and chocolate cake and frosting, it’s really two cakes in one, the decadent indulgence of someone who can’t decide which kind of cake and icing combo they prefer. Being that we’re far from home, I decided I’d try my hand at making a shadow layer cake for Evan’s birthday. But when I searched for recipes online, I found none. 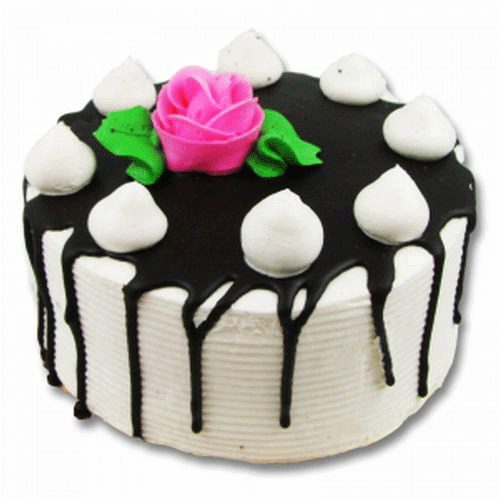 Plenty for seven layer cake, and even tons for something called shadow cake that is not the same thing. I only found kosher bakery upon kosher bakery teasing me, offering to have one ready for me to pick up in New York. So I called upon my memory and set about making the best replica I could. 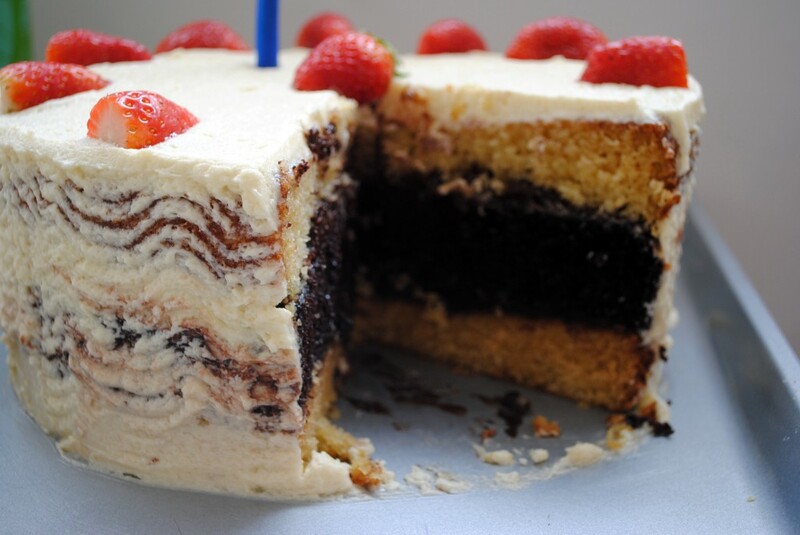 The structure of the shadow layer cake is as follows: vanilla or yellow cake topped with chocolate icing topped with chocolate cake, followed by another layer of chocolate icing and yellow cake. The entire layer cake is then iced in vanilla buttercream. Traditionally, a chocolate ganache-type frosting would then be drizzled on top of that to create the”shadow” effect. I added strawberries instead, as I’m an advocate of fruit and chocolate and strawberries make everything look pretty. To make this, I would need to bake two cakes and prepare at least two batches of icing. All with a fickle oven and without the assistance of my poor KitchenAid stand mixer that has been temporarily abandoned in storage. I used a hodge podge of recipes to make the final product. I went with a yellow cake, although plain white may have been more true to life. In the end it turned out as so many things I make in Israel do – good, but unexpected. It doesn’t taste remotely like Best Ever Bakery’s shadow layer cake, but I may have a new tradition to return to. Happy Birthday, Evan!! Preheat oven to 350°F. Butter one 8- to 10-inch cake pan. 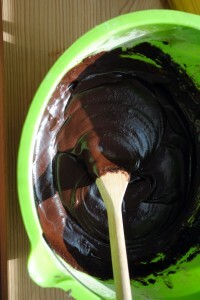 Mix together the cocoa, flour, sugar, baking soda, baking powder, and salt. Add the eggs, buttermilk, water, oil, and vanilla and beat until smooth. Pour batter into pan and bake until set, about 35 minutes. Preheat oven to 350°F. Butter two 8- to 10-inch cake pans. Sift together the flour, baking powder, baking soda, and salt and set aside. In a large bowl, cream the butter, then mix in the sugar. Add the eggs one at a time, mixing after each addition. Add the flour, alternating with the buttermilk and vanilla. Divide the batter between pans. Bake 35-45 minutes, or until set. Sift together the confectioner’s sugar and cocoa powder. Add butter, milk, and vanilla. Stir until smooth and free of lumps. Beat the butter, 3 cups of sugar, milk, and vanilla until smooth and creamy (if no mixer is available, an old-fashioned hand mixer works wonders; a simple wooden spoon just doesn’t get the texture quite right). Add more sugar as needed to achieve desired consistency and sweetness. Make sure the cakes have completely cooled, overnight if necessary. Place one yellow cake layer on a cake stand or other flat surface, flipping the cake so it is upside down (the bottom of the cake will be flatter). Cover just the top of the layer in chocolate frosting. 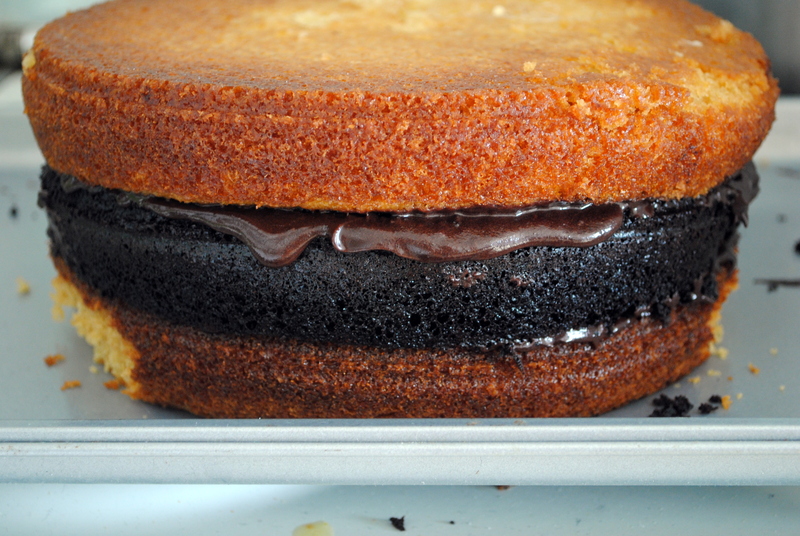 Carefully place the chocolate cake on top, cutting straight across to make the cake even if necessary. Cover the top in chocolate frosting. Place the second yellow cake layer on top so it is even (again, putting it upside down will ensure the flat side is on top). Working with an icing tool or butter knife, carefully cover the entire cake in vanilla buttercream. 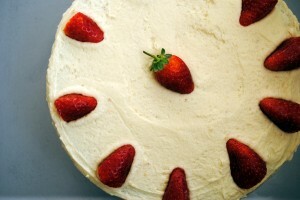 Top with strawberries, if using. looks pretty scrumptious to me! happy birthday evan!